This weekend you fortified yourself against the bracing winds whipping off the lake with layers of flannel shirts and wool hats, down coats and Thinsulate gloves, thermal long johns and cask-aged bourbon. 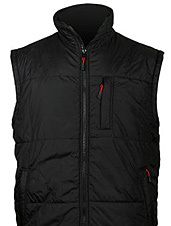 But now it's time to fight back the best way you know how: harnessing the power of a good, solid vest. Introducing the Heated Vest From Frontgate, battery-powered outerwear that ups your body's BTU quotient while enhancing your winter wardrobe. Three heating pads embedded in the coat—two in front and one in back—can be adjusted according to your current needs: low, medium or walking on Wacker Drive in January (aka, high). And if you're worried about looking like a robot lumberjack, don't be: the heating pads and control mechanism are nestled inside the vest, completely invisible to anyone except those you let get close to you, who will no doubt feel the warmth emanating from your direction. And then, they'll probably just assume it's your personality.